Welcome to the police state the ‘conspiracy theorists’ tried to warn you about. Since 9/11, Cops have killed well over 5,000 Americans in the line of duty. Many of these killings have occurred during no-knock raids, which have risen by 4000%. The police are said to be here to serve and protect you, but it seems they’re getting paid from tax dollars to kill, threaten and bully you, the person they’re supposed to be protecting. The American government dubs anyone who opposes their agenda, “terrorist” while employing actual terrorists by definition, on it’s own citizens. Police now kill more Americans than the “terrorists” from whom they “protect” us. You are eight times more likely to be killed by a cop than by a terrorist. 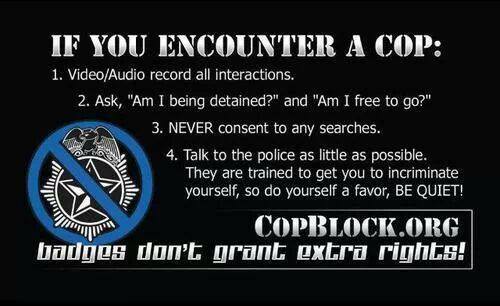 The badge and authority is way scarier than any criminal, as the cop is protected by governmental law. Domestic violence is two-four times more common among police families than American families in general. As of 2010 the compared data lifted from Cato’s NPMSRP shows that police officers were reported to have committed sexual assault more than 2 times the amount of reports in the entire general population. If officer involved killings were prosecuted as murder the murder rate for law enforcement officers would exceed the general population murder rate by at least 472%. And these are only the reported incidents. Who knows what the actual total is. 700%? 1000%? Furthermore, over a quarter of a billion human beings were killed by government last century alone, making government the leading cause of unnatural death in the 20th century. This do not include casualties from all the wars that governments also started to “protect” us. Without the government, who would be here to kill us for our safety? It’s only natural, that the trigger happy government employees in costumes are keeping up with the trend on our streets. They have a status quo of killing to keep up with, trying to compete with the politicians of DC to see who can kill the most innocent people in the name of protecting you. The number of Americans in US prisons now exceeds the number of high school teachers and engineers. There are about 7.3 million Americans locked in captivity or under federal control, the majority of whom are non-violent (Marijuana is one of the biggest examples of the prison system run amuck, a plant from nature is deemed “illegal” as the government is scared beyond words of legalizing hemp and loosing a lot of money for their crony friends). About one in 25 Americans were arrested as of 2011. As more laws are established for our “protection”, those numbers are bound to grow. Whenever people defend police, they’ll say “not all cops are bad”, well i beg to differ. If you are following orders, upholding corrupt laws simply designed as money grabs, and harming the people you are sworn to protecting then you are all bad. If the police are here to protect us from the criminals, who is here to protect us from the police when they are the criminals?